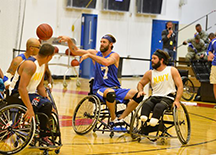 Retired Senior Airman Ryan Gallo makes a pass during the Air Force wheelchair basketball game against the Navy at the 2014 Warrior Games Sept. 29, 2014, at the United States Olympic Training Center in Colorado Springs, Colorado. The Air Force team lost 38-19 and would go on to play Special Operations in the next round. Photo courtesy U.S Air Force by Staff Sgt. Devon Suits. Near the end of his life, my Dad endured many of the maladies of old age — and steadily progressing Multiple Sclerosis. He didn't talk much about it, except when someone said, "Hi, how are you?" which was pretty often, because that's how we say hello around here. He had many stock answers for "Hi, how are you." One was, "Some days good, other days (pause) better!" He would deliver this line with perfect timing and an infectious smile, and when the laugh came, he'd join in. Another favorite answer of his for "Hi how are you" was, "Well, that depends…how much time do you have?" Always with the infectious smile. He never kept track of who'd heard which line before. But even if you'd heard a line dozens of times, his smile made it impossible not to laugh. He had a name for his afflictions — the debilitating arthritis, the muscles that no longer worked, the phantom pains, and so on. He called them "bonuses." When I first heard him describe his arthritis as a "bonus," I got curious. Me (not aloud, of course): Uh-oh. Dad: And this arthritis, I can definitely live without. part of LifeBonuses are part of Life. How we deal with them makes the difference between a happy life and something else. Here are some thoughts about dealing with bonuses. I don't think my Dad was "naturally" funny. He led a difficult life, filled with bonuses, and he learned somehow along the way that humor helped. He learned how to be funny. You can be funny, too. It's a skill, like jumping rope, or adding numbers, or burning toast. I'm really great at burning toast. Whenever you receive a bonus, you can think about it in different ways. The choice you make affects your happiness. Choosing a perspective that makes you even a little bit happy might be difficult — it might require a bit of creativity. Fortunately creativity comes with being Human. When you choose how to deal with a bonus, your choice affects the people around you, especially the people you love. Hiding your suffering doesn't work — the misery leaks out eventually. Wallowing in it doesn't work either. Choosing to be as happy as you can be is a good middle path. Would you like to see your comments posted here? rbrennPAujxSMloxLgtCvner@ChacbGVjReTCREcoBsuvoCanyon.comSend me your comments by email, or by Web form. Today we use data as a management tool. We store, recall, and process data about our operations to help us manage resources and processes. But this kind of management data is often scattered, out of date, or just plain incorrect, and taking a snapshot doesn't work. There is a better way. I offer email and telephone coaching at both corporate and individual rates. Contact Rick for details at rbrenepbMGVYGbFstxGLQner@ChacXCLiRuVnnpCByGrfoCanyon.com or (650) 787-6475, or toll-free in the continental US at (866) 378-5470.